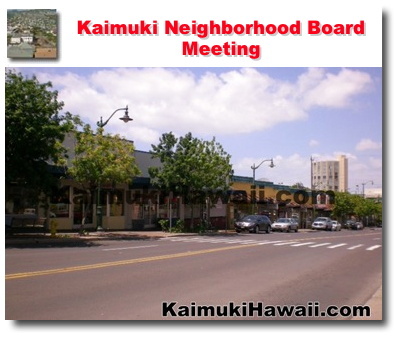 LAST MEETING NOTES - Click here to read Kaimuki Neighborhood Board Meeting March 2019 Minutes minutes notes prior to the meeting scheduled below. Note: The Board may take action on any agenda item. As required by the State Sunshine Law (HRS 92), specific issues not noted on this agenda cannot be voted on, unless added to the agenda. A two-thirds (2/3) vote (8) of this 11-member Board is needed to add an item to the agenda. Items may not be added if they are of major importance and will affect a significant number of people. III. PUBLIC INPUT: Limited to three (3) minutes each. Items that are not listed on the agenda may be discussed but no Board action may be taken. Please fill our form on the table for our Neighborhood Assistant. IV. PRESENTATIONS: Limited to (10) minutes each. V. ELECTED OFFICIALS: Limited to three (3) minutes each. A. Resolution in support of deferring Funding for the Ala Wai Canal Project during this legislative session. A. Reminder that the EIKIDEN RELAY RUN will be held on Sunday, May 19, 2019. The race is from Kapiolani Park to Sandy Beach and return. Visit http:/www.hnlekiden.org for more information. B. The next regular meeting of the Kaimuki Neighborhood Board will be at 6:30 p.m. at Kaimuki Christian Church, Fellowship Hall. A mailing list is maintained for interested persons and agencies to receive this boards agenda and minutes. 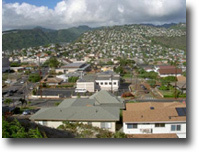 Additions, corrections, and deletions to the mailing list may be directed to the Neighborhood Commission Office (NCO) at Kapalama Hale, 925 Dillingham Boulevard, Suite 160 Honolulu, Hawaii 96817; Telephone (808) 768-3710 Fax (808) 768-3711; or call Christopher Naylon at (808) 768-3770 or e-mail chris.naylon@honolulu.gov. Agendas and minutes are also available on the internet at www.honolulu.gov/nco.